Carson’s free-wheeling spin on the original might be called translating forward. She tosses in anachronistic references along with a sly, straight-faced component of utter nonsense that dares the audience to buy it or even comprehend it. And as if that were not enough, director Jonathan L. Green further flummoxes expectations by reassigning roles across gender. Not once, but twice. 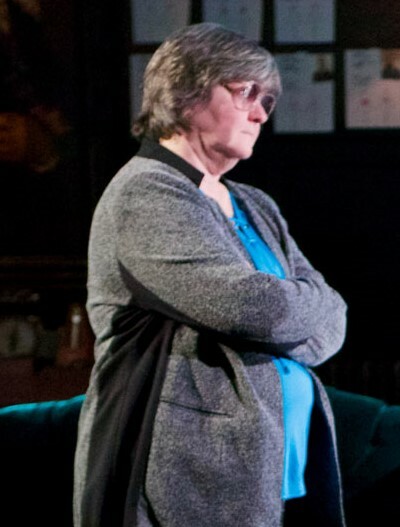 No sooner does the play end, than it begins again – with all the actors switching to different roles, again without regard to gender convention. The experience is absolutely fascinating. In Sophocles’ “Antigone,” two brothers have killed each other during a fierce political uprising in the city-state of Thebes. One brother, Eteocles, died fighting for the established order; his brother, Polyneices, perished as a rebel. Their sister Antigone wants to bury both of them, but Kreon, king of Thebes, forbids the burial of an enemy of the state: Polyneices’ corpse must be left where he fell on the field of battle, food for vultures and jackals. Antigone, arguing that the law of the gods supersedes human law, defies Kreon and buries Polyneices, ceremonially spreading dust over his body. But she is caught in the act and brought before Kreon, who summarily orders her death. At first, the citizens (Chorus) support Kreon, but when the blind prophet Teiresias reports that the gods have shown their disapproval, the people urge Kreon to relent. Too late, he revokes his sentence: Antigone has hanged herself, and Kreon’s son Haimon, betrothed to Antigone, then kills himself in despair; whereupon the king’s wife, Eurydike, takes her own life as well. Kreon, devastated by the rapid sequence of events, must live with what his arrogance, his hubris, has wrought. What Carson has evoked in her translation is Sophocles’ play as it might have been reconsidered by Beckett and Ionesco over drinks. It is absurdist, but by no means ridiculous. The title gives the first hint that this is not going to be the “Antigone” that won a Tony back in old Athens: It’s that pregnant suffix “nick,” now appended to Antigone’s name. It might suggest our girl has been re-imagined as transgender, but that’s not the case. 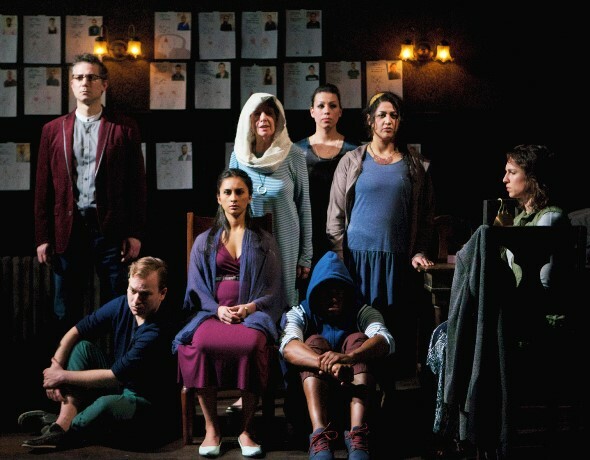 Translator Carson’s nick is more about time: Indeed, there’s a silent character called Nick who, in this production, tends to a metronome, that relentless minder of time’s nicks. And the Chorus chants about the nick of time. When Kreon finally decides to allow Polyneices to be buried, and to spare Antigone, he attends first to the burial – to appease the annoyed gods as hastily as possible – and then goes to release Antigone, only to find that she has just hanged herself. You can’t undo time, not such much as a nick of it. The translation is peppered with loopy conceits: Someone describes the arrival of Kreon, “rowing his powerboat.” Another time, Antigone’s betrothed Haimon declares: “There is talk, there are shadows. This girl here. I posit a lacuna – this girl does not deserve to die.” Does Haimon know the meaning of lacuna? And one character or another keeps chiming in to paraphrase Georg Wilhelm Hegel, the early 19th-century German idealist philosopher who saw Antigone as a symbol of the ethical value of the family versus the state. The blazing star in all this is Ann James, first as Kreon and then as Antigone, though you don’t see it coming in either instance. She makes a terrifying, Stalin-like Kreon, proud, willful, threatening. James then turns 180 degrees to become the compassionate girl, Antigone herself, who just wants a proper burial for both of her brothers. 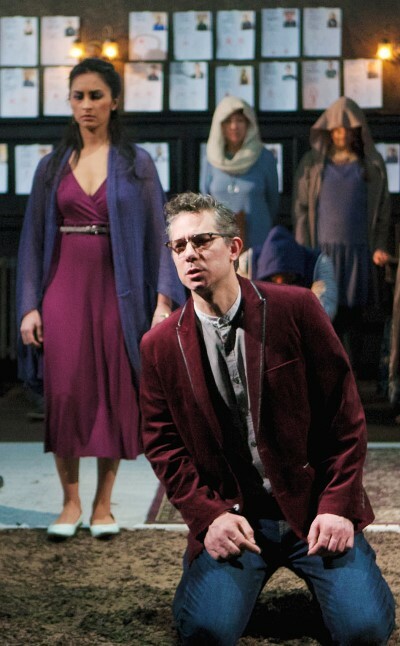 And what a changed atmosphere that switch produces as David Prete moves from Eurydike into the role of Kreon, who now appears before us as a firm but gentle tyrant, the Platonic ideal of the philosopher king. 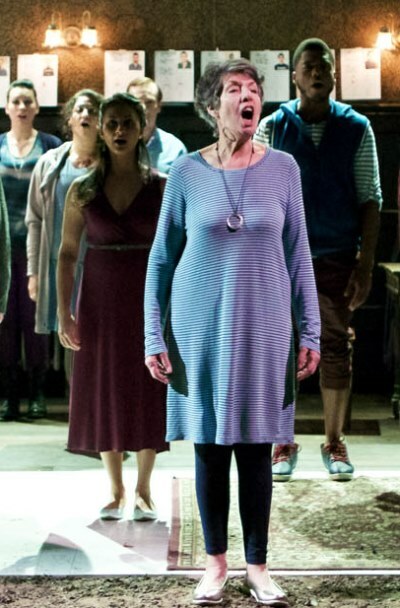 Amid a focused, disciplined and credible ensemble, Lona Livingston also stands out as the authoritative first voice of the chanting Chorus, and Anu Bhatt’s composed and articulate Antigone makes a persuasive appeal for common decency. Set designer Yu Shibagaki and lighting designer William Kirkham likewise make key contributions to a drama that holds you in thrall to the last syllable – twice.